Morning - its Sunday and I feel I must confess! I have posted this card before for another challenge, but I have never posted it here. I hope you don't mind! I've had a pretty hectic time this last week so I haven't had chance to make a brand new card and I love this image!! Its called Martini Bianca. I really enjoyed colouring her - she is a Minx! I added to some glaze to the glass to give it a shine. I am now on my hols from work for 20 days!!! I hope to relax and party a little as I am off to visit my Bestie but I don't think it will be so much that I end up like Martini Bianca... but I can't make any promises! Lol! Ah, it's a dog's life! This pooch really knows how to get comfortable. Today I've coloured up the Sofa So Good image from Dr Digi's House of Stamps. This looks just like my daughter's dog, a Weimaraner with those long lanky legs, and it really does sprawl all over the sofa....just like this. 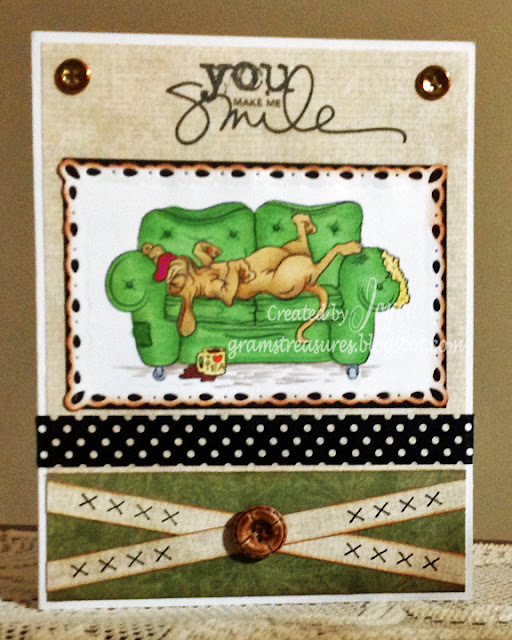 I do like the sentiments from the Tea Time Set! 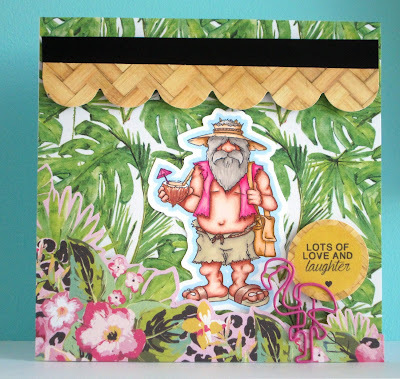 Great for quick cards and for using up scraps! The set - you get lots - is only £5 in the store. 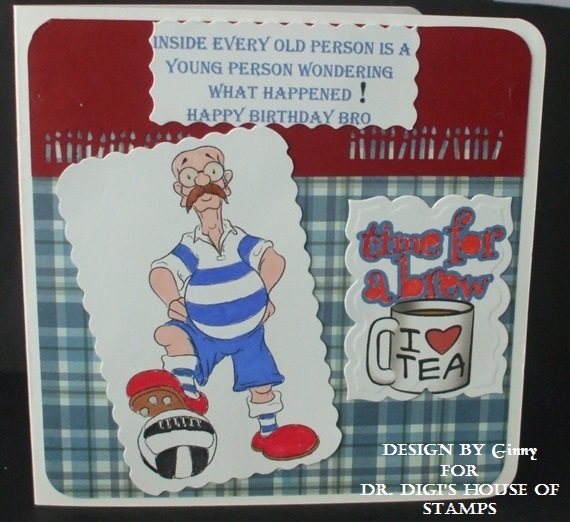 Good morning today from Dr. Digi's House of Stamps we have Dunderton Acedemicals FC . Derrick is so happy the football season has started he has enjoyed England winning the ashes but football is his main sport. I have also use Tea Time Sentiment sheet 01 as my brother can’t go more than about 10 miles without stopping for a cupper! 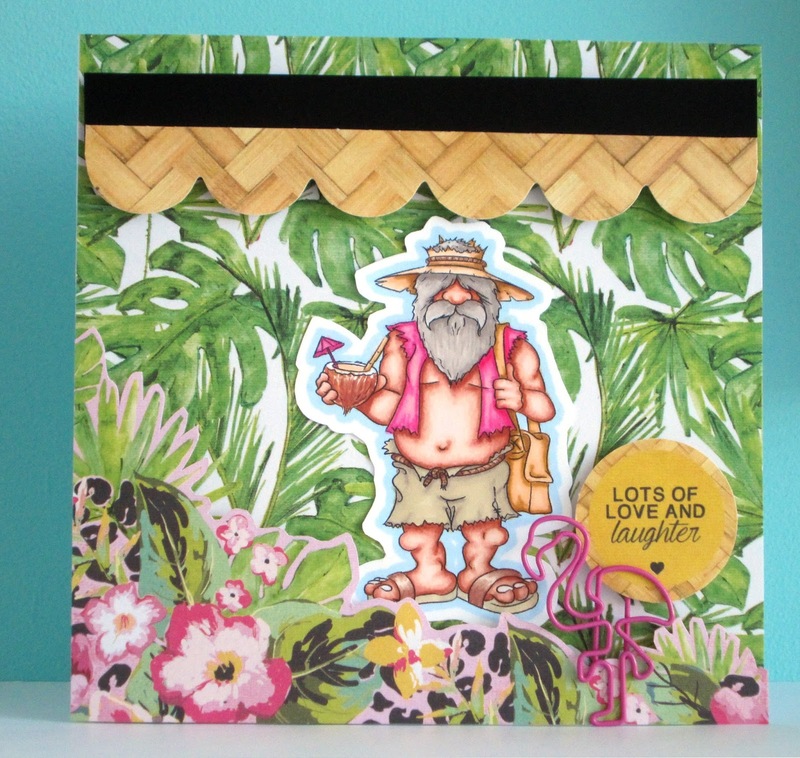 More details on this card can be found over on myblog . This is Svetlana & Cyril... aren't they fab. I love Cyril's face and how pleased he is with himself for having such a blessed Nurse! 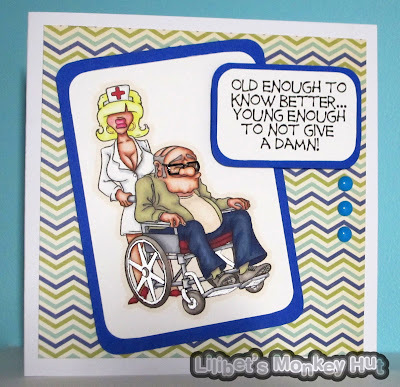 And don't be fooled by him - he knows exactly what he is doing hiring Svetlana to care for him in his old age! 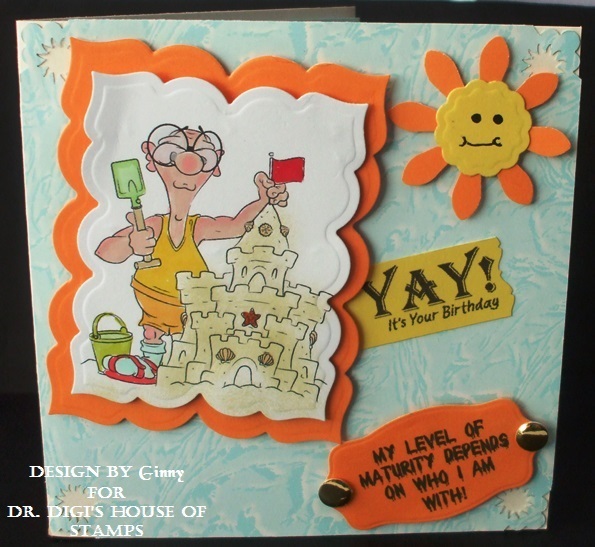 The greeting is from Birthday Sentiments 1. I've left the image and greeting to take centre stage but I'll have to think carefully about who I'd give this card too... wouldn't want to offend! I'm also pleased to say I have a new laptop so well prepared today with this post. 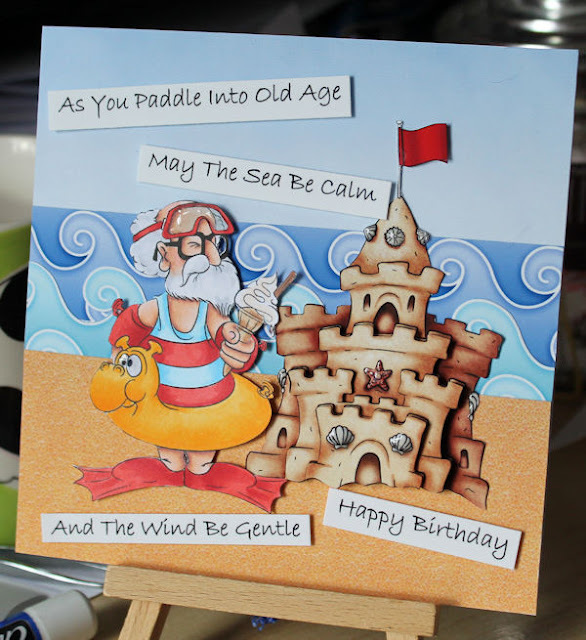 If you would like to know all the fine detail and card recipe - pop over to my blog. I love the sea and the strand. 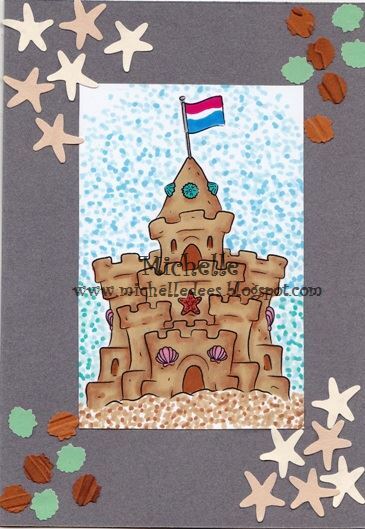 Always looking for nice shells and try to make sandcastles. Here is the Sandcastle I never could make. You find this nice image HERE. I think we all have these types of mornings, I know I do! Had a day out with a lot of walking yesterday so I wasn't particularly keen on doing either this morning. You can find Nightcap Derek HERE. Hope you all have a good weekend, think it s supposed to pour down here, what a shame, all the more time for colouring and crafting! There is nothing more satisfying than getting out on the open road, the wind in your hair and the feel of all the flies splattering against your goggles. Luckily this does not deter Beryl the Biker - anything to get away from the rat race! Morning All - Wow I would love to be relaxing somewhere with a cocktail right now... Really rubbish morning so far! I've been working late so was trying to get this post up for your this morning as soon as I woke but my laptop has decided to die on me! Ever tried to do a blog post via an ipad?? Our Bob still has his party shirt on despite the fact hes stranded... nothing will get him down! Check him and his mates out over at the shop. Sorry it a quick dash and run today... I promise next week I will be much more organised and less tardy!!! 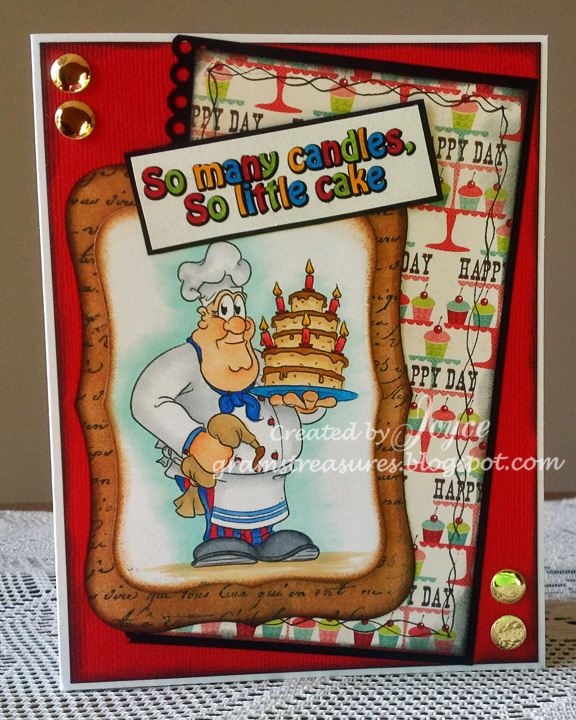 Full card recipe will be posted over on my blog at somepoint ... Ha ! Have a great week people and fingers crossed the sun currently coming though my windows stays with us long enough to get our cocktails like Bob! 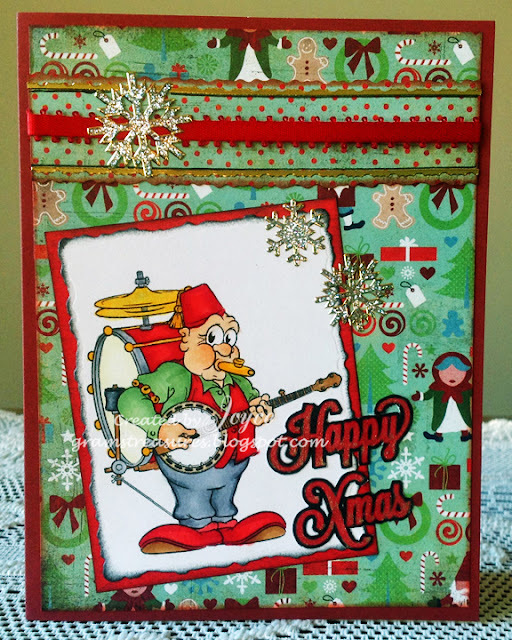 Just when you thought you'd seen and heard everything....here is the newest contestant for the Christmas talent show, with his take on the little drummer boy. 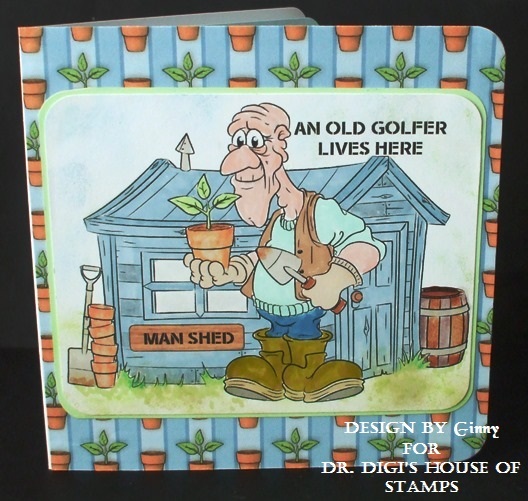 This is a new image from Dr Digi's House of Stamps, titled One Man Stu and his Magic Kazoo. I just couldn't resist making it into a Christmas card, and I know who will be the recipient too! Well today here in Manchester you need your wellies and your waterwings, just to go outside and only the bravest of souls would get in their cars and drive to our nearest beach! Ambrose has taken a break from his search of the deep seas to build a sandcastle and have a 99. Fridays on our road are known as Kenny days as that's the day most of the kids get their ice cream fix from Kenny the ice cream man, there are those who make the claim that every day should be a Kenny day but the parents are winning the war- so far! Loaded with a 100 watt bulb torch and a walkie-talkie (good for organising his shift-end breakfast) Night Shift Shaun is ready for any man or animal that dares cross his path during his patrol around the bus shed. Now Sidney loves going to the sea side with the grandchildren because it means he can be a kid again making sand castles. Look at him he is in his element! Hello World. I am actually at work whilst your reading this. Clever technology isn't it! Speaking of technology - I love this Lightbulb image from Dr Digi. And guess what... IT IS FREE!!! RESULT! You could use this image for so many occassions - New Home, Passing exams, Valentines or any celebration. Its a great image to use up your scraps of paper, and being a Digi image - you can print it to whatever size you need. The big bulb I printed onto Mirri card first but with the others I used a silver pen. I really wanted the colours to jump off the page so I used a matt black background. 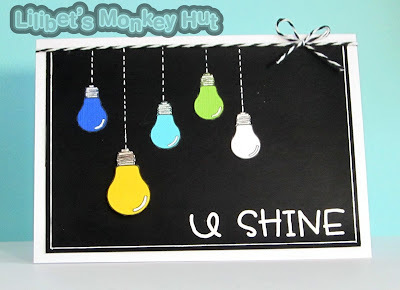 I used a white pen to add the edges, the light cords and also to give the bulb a shine. 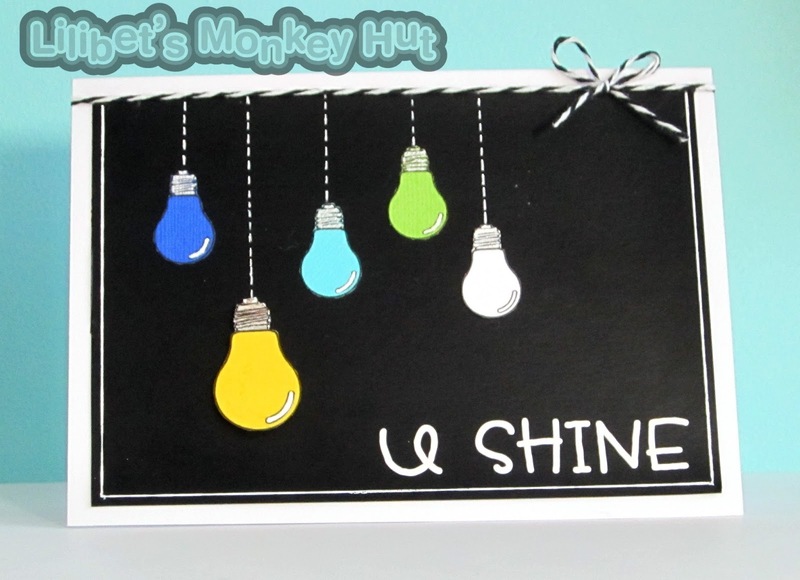 I added some letters to say "U SHINE" and finished it off with some co-ordinating twine. I think this digi must be my favourite. 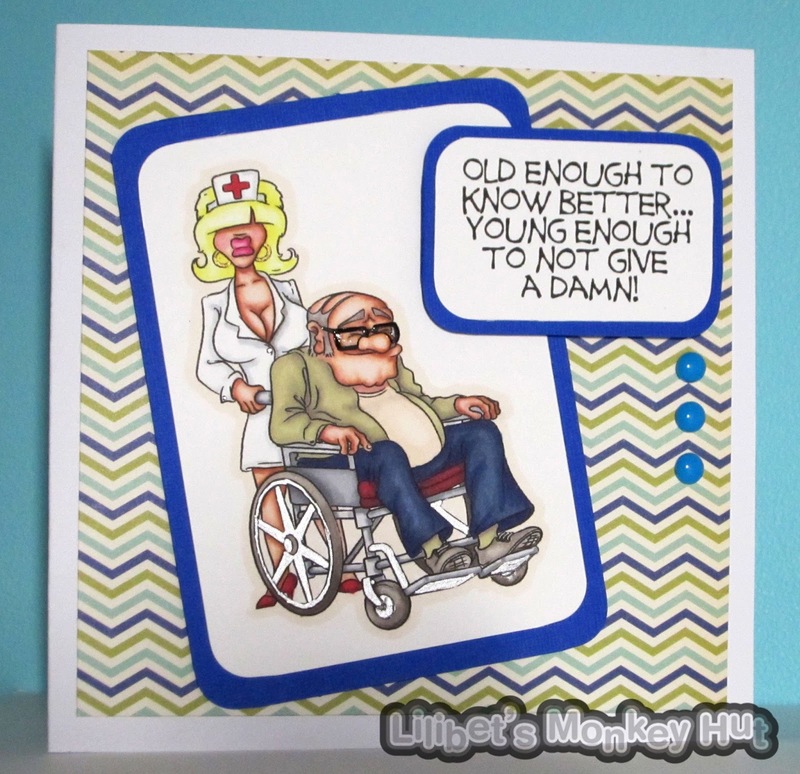 And its so easy to colour and add to a card! Buy the Cuppa digi from the store. Fab printed papers are from the Tea and Bickies set - full of lovely biscuits and with zero calories! 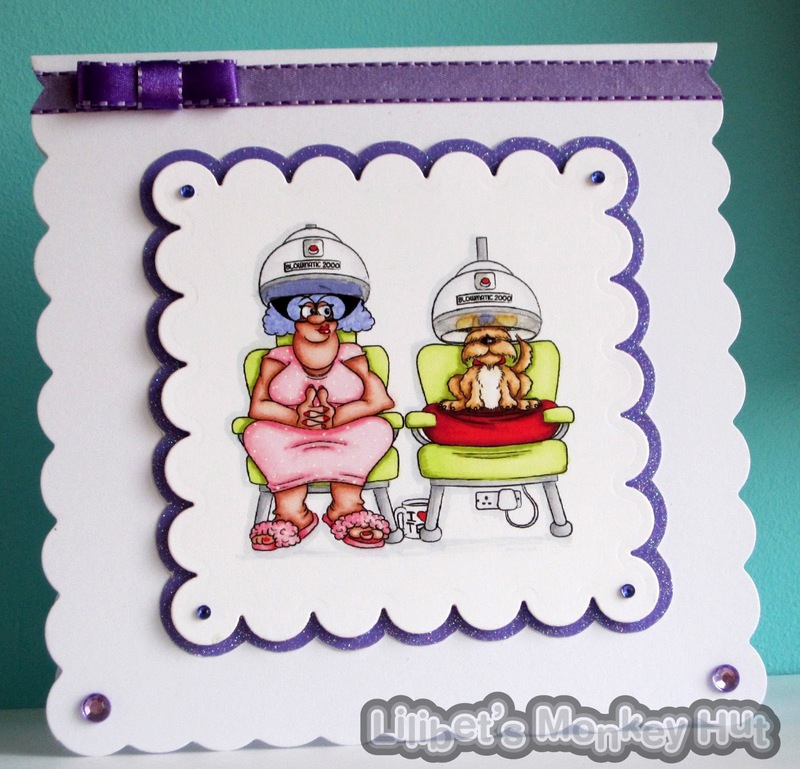 Morning All - It's Sunday Morning and time for me to post my latest card featuring Salon Deirdery from Dr Digi. I love her attitude! Just look at that Pout! I printed the digi image quite big and allowed Our Deirdery and her furry companion to take centre stage. Obviously she had gone to get her purple rinse at the Salon - so I stuck with the purple colour scheme! I've coloured the image with promarkers and kept it all fairly simple. 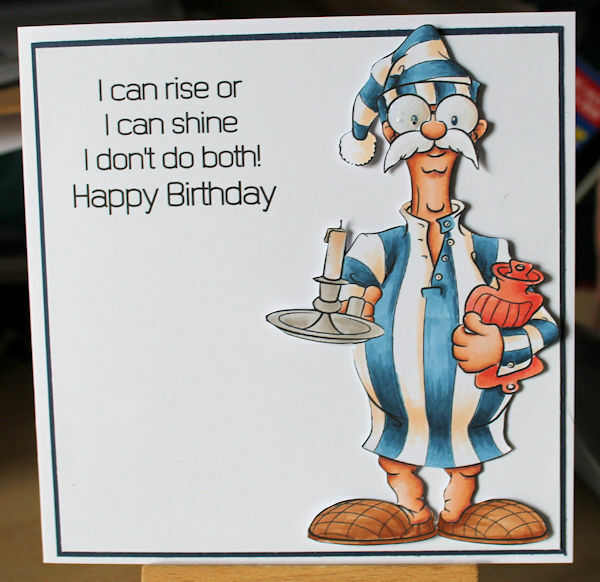 For full details of the card recipe - have a look at my blog - here. Have a lovely day - I think Sundays are definitely a day for pampering and relaxing. Mmmm, doesn't that look yummy! As birthdays are supposed to be good for you....there are no calories in this cake either! 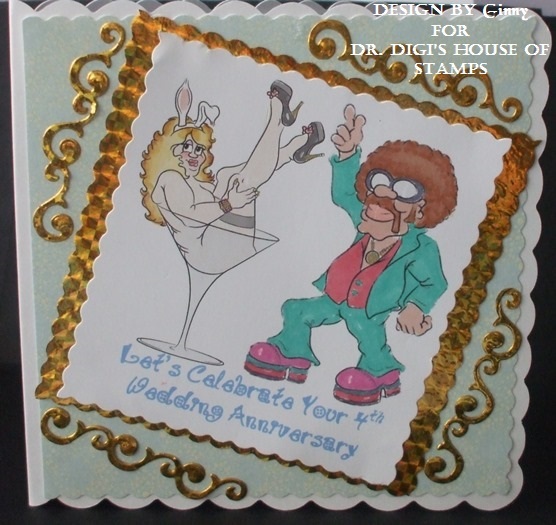 Today, my DT card uses the fantastic image from Dr Digi's House of Stamps, titled Baking Brian, and you can find the sentiment here. Did you notice that everything seems to taste so much better when someone else cooks or bakes it?